It’s a Filipino word, which was derived from the Spanish “Como esta”. But enough about Philippine history, before I start messing up what the historians have written for the rest of the world to see. This post is yes, you guessed right, about Kei Kobayashi. This charmer was born in Brazil, but reunited with her motherland Japan since her teenage years. Let’s talk about this cool gal more, shall we? I met Kei back in 2012 when after a long week of completing a small collection, me and the girls went to a bar to hang out and just chill (work-related talk was prohibited!) the night away. Kei was a band member of an eclectic bossa nova band, and she was as talented as she was striking! I thought she’d really look great in my collections! So after a little bit of introducing her to my stuff, and a few margaritas, Kei agreed to occasionally model and wear in her gigs, some of my creations. Me and the girls are ecstatic! Another unique gal in the atelier! She can’t start her day without coffee, loves the beach and is a sucker for soccer! She believes that anybody can have it all – just keep your list short so it’s doable. Kei dropped by the atelier this weekend to try on some of the stuff I recently made. So, expect more of Ms. Kobayashi in the coming days around here. 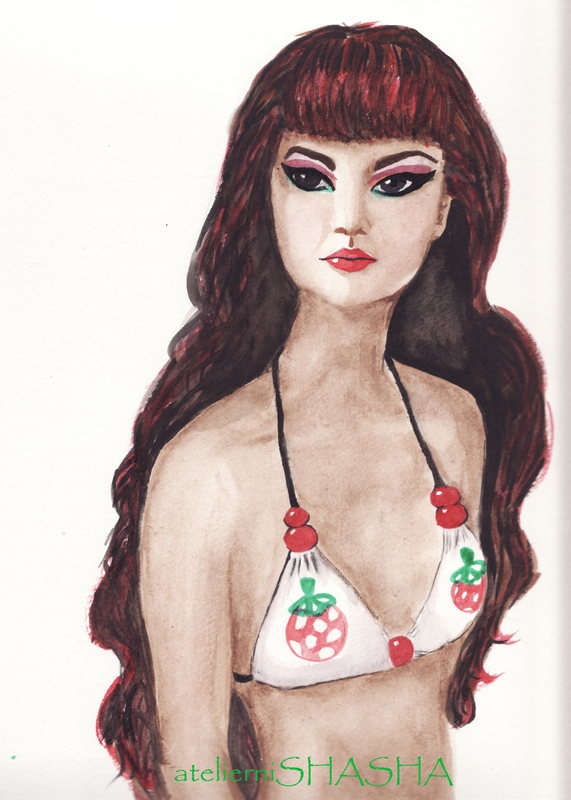 But in the mean time, here’s a snapshot of a watercolor I made in 2012 with Kei as my model. P.S. Kei was in past life Color Infusion Ayumi, been given a new body from Poppy Parker, and traded to me by a dolly friend from the US. She arrived in good condition but had her hands and feet turn green after a couple of years. She’s currently borrowing hands with Sophia during recent shoots. Hello there, Marta...thanks so much for always dropping by.. Yes, Kei is fabulous but she doesn't know it.. Ssshhh haha! Your outfits are always the cutest! I am working on some for Marta and with courage will take on some knits too, thank you so much for encouraging me to "challenge" sewing for fashion dolls again. Kei is trully gorgeous. I love everything about her especially her hair. The color of her hair is to die for, it matches the shape of her gorgeous face. Kei Kobayashi is trully the perfect model of AtelierniShasha.